"We'll most likely have at least one Star Wars title a year over the next three or four years," said EA CFO Blake Jorgensen. "Next year we will see Star Wars Battlefront back with bigger and better worlds because we now have the new movies to work off of, not just the historical movies that we used before." The recently announced Respawn (Titanfall) third-person Star Wars title was also mentioned, but not given a timeframe, suggesting that it will be the annual release following Visceral's game. Canon to the films, the majority of the story is told from the perspective of Iden Versio, the leader of an elite special forces unit of the Galactic Empire, named Inferno Squadron. Iden and her team are a hybrid of fighter pilot and commando, as lethal on the ground as they are in a vehicle, and well-versed in all the Empire's tech and gadgets. Iden also has her very own droid buddy who attaches to the back of her armour and will serve as part of the moment-to-moment gameplay experience. Iden will allow fans to experience Star Wars from a brand new perspective, that of a heroic figurehead for the Empire. Never described in the game as a villain, Iden's main motivation for attacking the Rebels is to avenge the death of the Emperor. At certain points in the story there will be opportunities to become hero characters, some of which will allow players to experience the events from the side of the Rebellion. In one mission, teased in the new trailer, players will be able to control Luke Skywalker in his familiar Return of the Jedi outfit. Along with the new campaign comes a brand new planet - Vardos, an Imperial utopia created specifically for Battlefront 2, where children of the Empire grow up in peace and aspire to be elite soldiers like Iden. The multiplayer will span the entire Star Wars universe as we know it today. That means players will have access to weapons, ships and gadgets from the prequel, original and new Star Wars trilogies. It will not feature content from the recent spin-off movie, Rogue One, or the animated series, Star War Rebels. Four Trooper classes have been introduced for Battlefront 2, each with its own customisation and progression systems, plus a number of cosmetic character types the Rebel Fighter, Imperial Officer, Stormtrooper and Federation Droid. The classes are based on relatively conventional differentiating factors, like range or firepower. Also featured are hero characters from across all eras, including Rey, Darth Maul, Luke Skywalker, Yoda and Kylo Ren. In a major gameplay change, these hero characters will now have their own career paths, allowing players to unlock new abilities for the heroes and tailor them to their play style. While EA remained tight lipped about the specifics, the way you acquire heroes and vehicles will no longer rely on randomly spawning pickups. Instead, the ability to change into a hero or board a vehicle will revolve around some kind of resource-based system. In terms of ships, you can expect classic specimens such as TIE Fighters and X-Wings, along with iconic ships from the new trilogy, such as the First Order TIE Fighter. Concept art shown in a behind closed doors panel also featured Obi Wan's Jedi Starfighter being chased by Jango Fett's Slave One over the waters of Kamino, so it looks like hero class ships from the prequels are in the game too. The Millennium Falcon makes its return as a hero class ship, but this time it's the new trilogy version. Like the Trooper classes and hero characters, vehicles can also be customised with new abilities, gadgets and modifications available to unlock through the aforementioned resource system. Also confirmed is the existence of rideable Tauntauns on the planet Hoth. You can use them to get to get around the battlefield faster and to ram enemy soldiers. You cannot use them to keep warm. 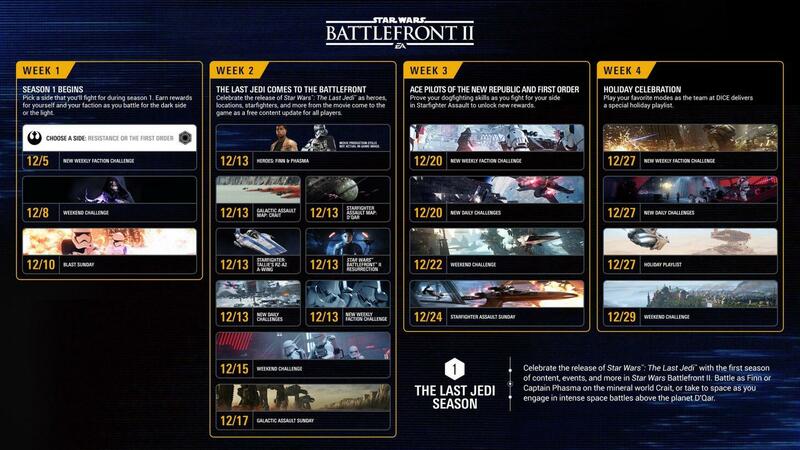 Star Wars Battlefront 2 is scheduled for release on the 17th of November.